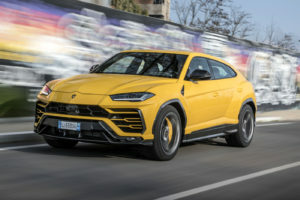 The car world is being slowly taken over by SUVs and turbocharged engines and that’s shame, we’ve lost that charm as engines become increasingly more complicated and emissions have become more stringent. 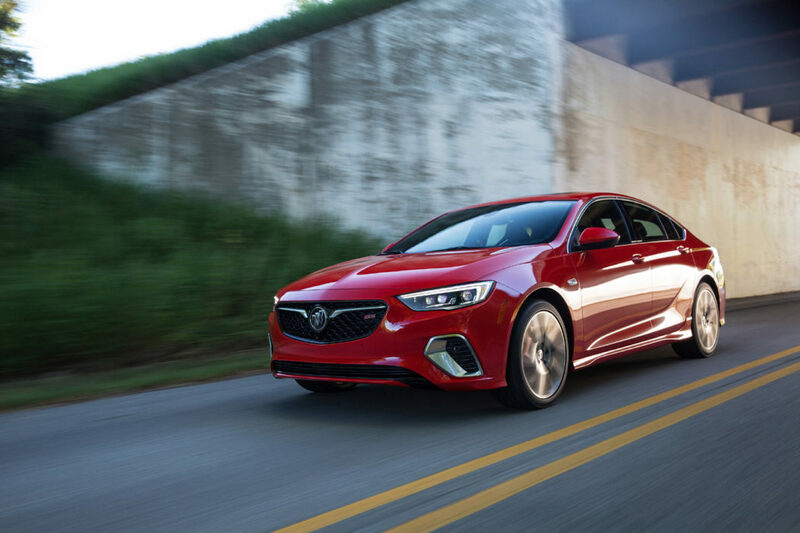 There are still a few normally aspirated V8’s out there, but the majority are American since the Germans have now totally eschewed them. 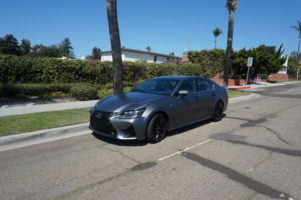 There is some hope though, there a couple of fine examples that you can buy today, one of which is the glorious 2019 Lexus GS F anniversary edition, which was delivered to me the other week. 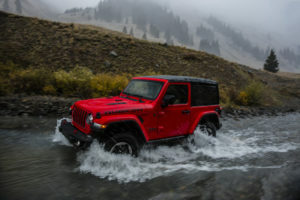 Firstly I wasn’t expecting to get the anniversary edition and secondly I hadn’t realized that only 100 of the 2019 model were built for the US market. 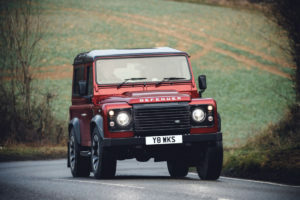 I was, in fact, driving the rarest car I had ever driven. Add to that it was so new it didn’t have license plates and the sill plates still had the plastic wrap on them. I left it on. 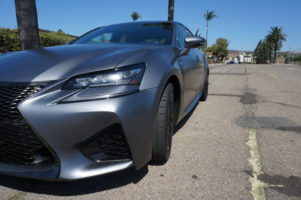 So what do you get for the additional $5,000 you need to fork out for this model?…well you get matte grey paint and it makes the car look positively evil and it even has its own handbook on what you can and can’t do to it. So no polish, no wax, no harsh chemicals just the same kind and gentle soap you use to wash your cashmere sweater. 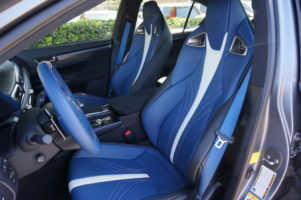 Other goodies include a bespoke blue interior including F performance leather seats, blue Brembo brake calipers, F steering wheel and shift knob, blue Alcantara trim and an engraved anniversary plaque. 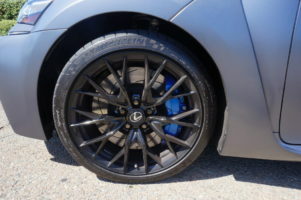 It was also shod with some very tasty 19 inch BBS, high gloss forged wheels wrapped in Michelin Pilot Super sport tires. 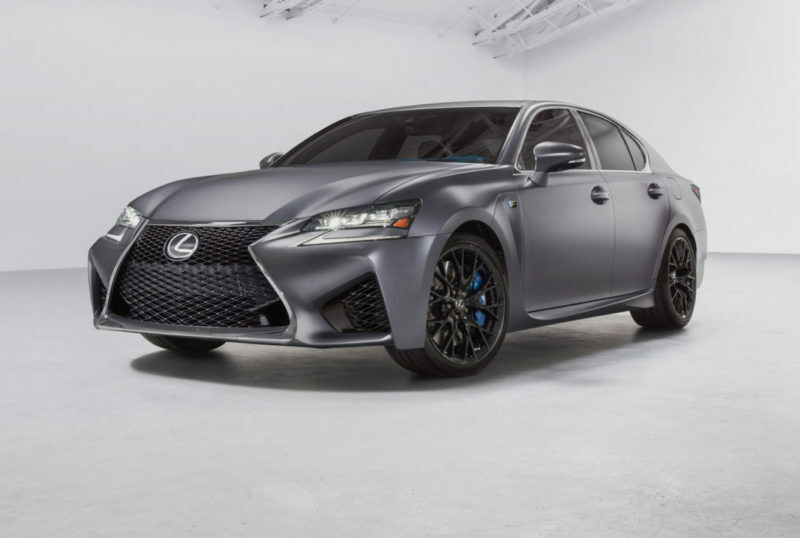 The Lexus GS F is an anachronistic delight, no turbos just normally aspirated goodness from a 5.0 V8 engine pumping out 467 hp @ 7,100 rpm and 389 lb-ft @ 4,800 rpm driving the rear wheels via an 8 speed automatic transmission. It doesn’t get any better than this. 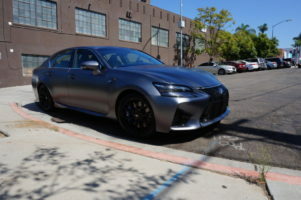 Of course this is significantly down on power to its German competition who all have uber-sedans with north of 600 hp, but this doesn’t seem to matter, because the Lexus has managed to create a car that is an absolute hoot to drive. Is There A Devil Lurking Inside? 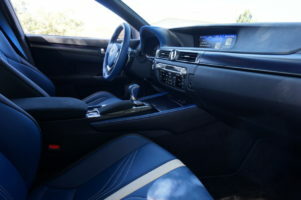 There certainly is, but you’ll have to twirl a knob and push a button selector in the center console to make it do things you wouldn’t expect it to do. 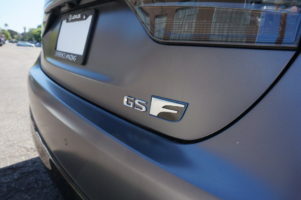 Driven in Eco or Standard mode the GS F does a remarkable impression of a GS 350, the engine quietly warbles along, the suspension is compliant and unless you push the gas down hard it remains as peaceful as the eye of a hurricane. 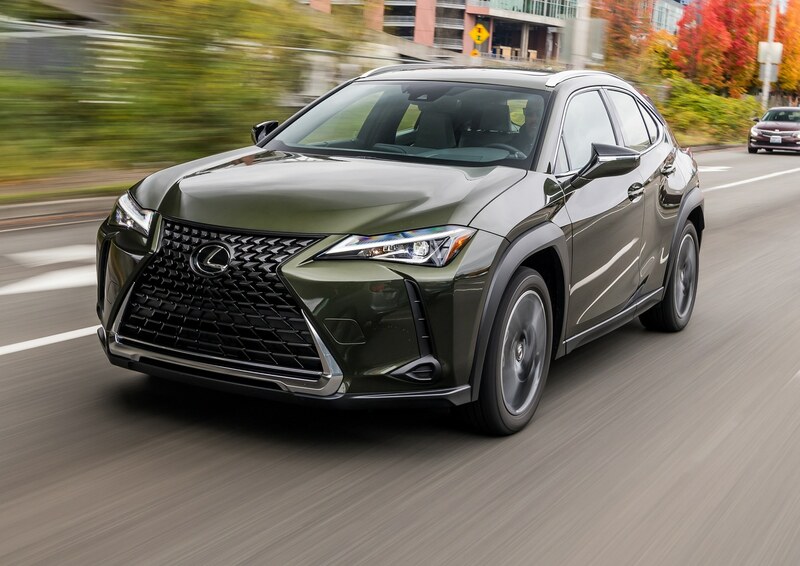 Explore the outer edges, however, and this Lexus knows how to have fun. This all changes when you select the Track mode, yes it has a Track mode and a Slalom mode too. 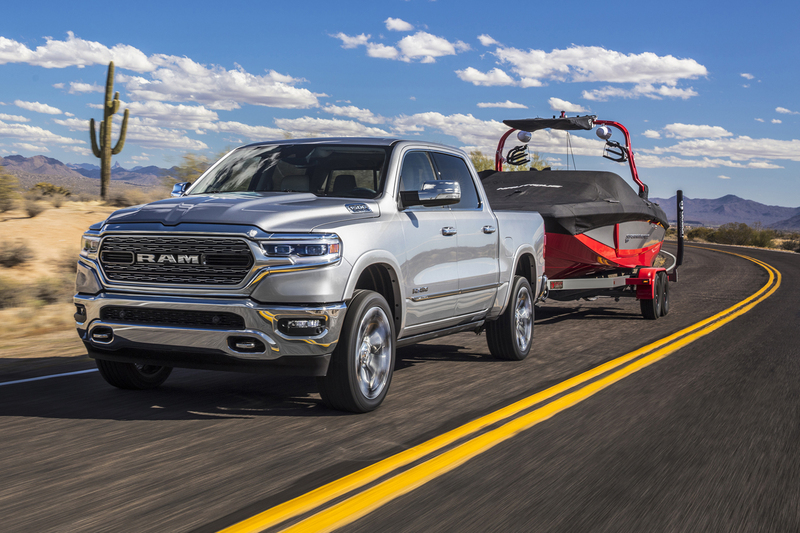 Then you select Sport + mode and the beast wakes from slumber. 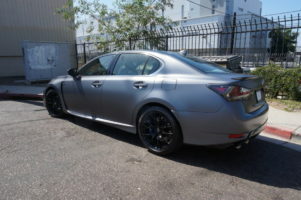 The suspension is sharper and all of a sudden you can hear that V8 noise inside the cabin. 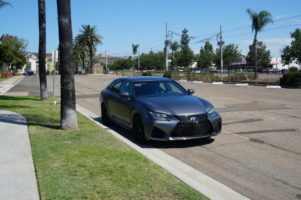 True it’s piped in but that avoids scaring pedestrians silly, that’s not the Lexus way. 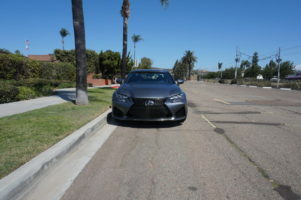 Anyway I digress……once on the move the suspension allows for a modicum of body roll but that’s good as it helps to keep the Pilot Super Sports planted. 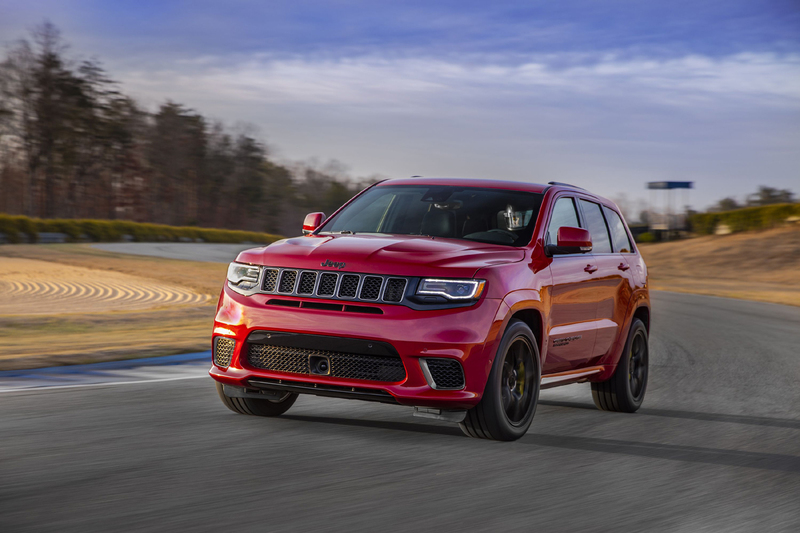 I have to point out this is not a drag race kind of thing, you know, more an open road blaster and throw in some twisty bits kind of thing. 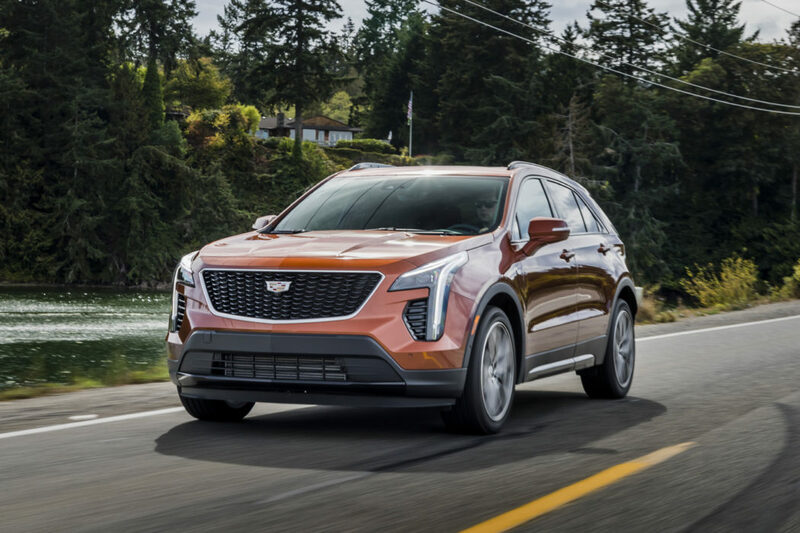 The big V-8 begs for more and more rpm with peak horsepower arriving at a heady 7,100 rpm, and the transmission obliges by holding the revs at 4,000 and above once it realizes the human behind the wheel requires spirited driving. 0-60 is dispatched in 4.4 seconds, but this is purely academic. 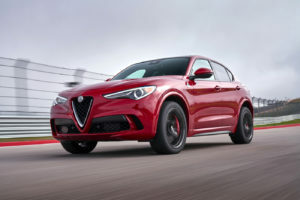 Dive into a corner and the standard Torque Vectoring Differential system kicks in by precisely controlling torque to each rear wheel through the engagement of a multi-plate clutch. 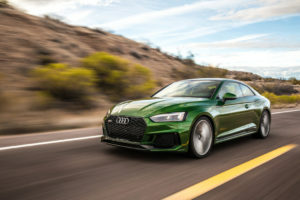 It operates as quickly as 1/1000th of a second, whether the accelerator is pressed or not, based on data including throttle input, braking, yaw rate, longitudinal and lateral G-force. It’s tremendous. 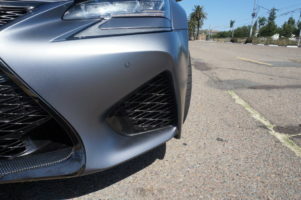 Under-steer is all but eliminated but the GS F never feels out of control even under sharp cornering and the car communicates its limits without adding drama. 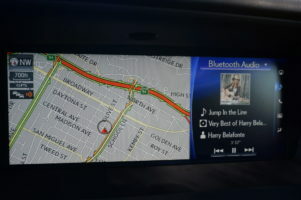 I didn’t actually us use the Mark Levinson sound system since the V8 wail from the 5.0 was utterly intoxicating. Yes it’s that good. 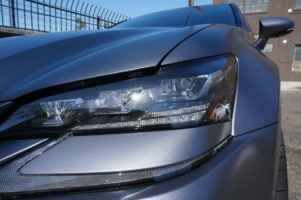 The steering is about as good as it gets, confidence-inspiring and has plenty of feedback while the brakes provided excellent fade free stops time after time. In fact on one occasion due to heavy stopped traffic I had to stomp on them so hard my biggest worry was that someone behind wouldn’t be able to stop in time. 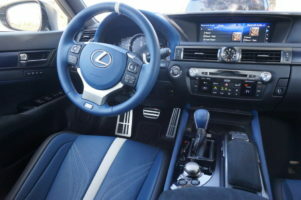 Slip into the very comfortable F performance seats and soak up the luxury, this Lexus smells good and not just the new car smell because it hardly had any miles on it, but the rich earthy smell of tanned hides. 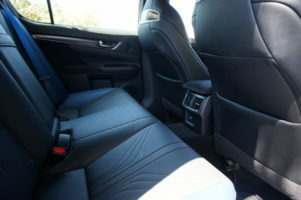 The drivers chair has 10 way power and has plenty of bolstering for those high speed cornering maneuvers. 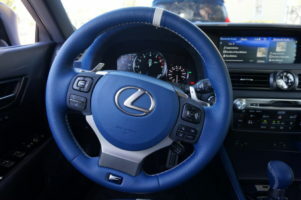 Lexus’s premium infotainment system with a 12.3 in screen, a touchpad controller, sat nav, and a multimedia interface looks super cool, the weird mouse controller, however, is fiddly and like trying to play a video game while you drive. Instead I just sat in my driveway, paired my phone, set the sat radio to channel 33 for afternoon music and to FM for NPR in the morning. The rest of the time I didn’t mess with it. 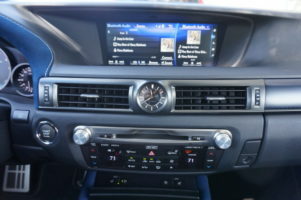 The dash is an interesting mixture of analog and digital gauges that seem odd at first but works well. 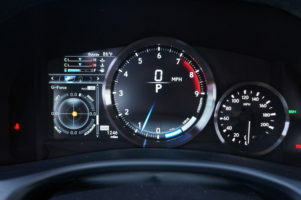 The large digital tachometer changes when you switch drive modes going from cool blue in Eco mode to red in Sport + mode, which makes perfect sense. Back seat drivers get decent legroom although I didn’t try it for myself but on the odd occasion I did have passengers they were mostly screaming for their lives and therefore not too concerned about legroom. Just kidding. I don’t normally make comments about test vehicle trunks unless they are the size of a thimble or I can squeeze a hippo in there. What caught my attention, while I was rummaging around back there to see if there was a spare tire, was the quality of the carpet. 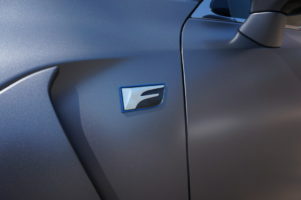 I found myself running my hand over it while oohing and aahing at the same time, strange I know, but it’s this attention to detail that makes this car so great. 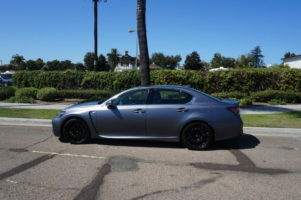 I truly miss the Lexus GS F like no other tester I have had before, maybe because it’s not perfect, maybe because it’s surprising it even exists because what Lexus has done here is to create a work of art, a car with soul, one that invokes passion, that makes you want to drive for no reason, simply put it’s a love letter to the normally aspirated V8. 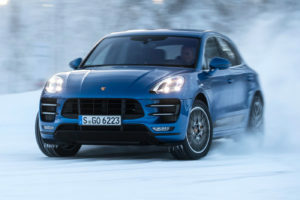 You should drive one while you can, buy one if you can afford one, because infotainment issues aside this car will create a memory you will never forget.